Figo brings some of our latest technology to this class. The device dock is designed to securely hold your MP3 player, portable navigation system or cell phone within easy reach. It lets you stream your music through the vehicle’s speakers via Bluetooth® or a USB cable connected to the radio. MyKey® owner controls let you program certain functions, such as maximum speed and maximum audio volume, for each key fob. Makes it easy to stay connected with your world when you’re away from home. Once paired, SYNC recognizes your phone and automatically transfers your contacts to support voice calling. with ample room for 5 occupants and their luggage. It’s also well-equipped with convenience features. Air conditioning and an AM/FM stereo/single-CD player with MP3 capability, USB port and auxiliary audio input jack are standard. A tilt steering column helps you get comfortable behind the wheel. Power front windows and central door locking can enhance your ownership experience. Figo is at home in the city. Compact external dimensions and electric power-assisted steering make it perfect for maneuvering along narrow streets and parking in confined spaces. 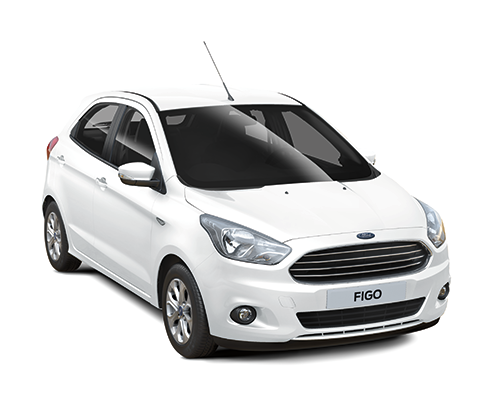 Figo offers spirited performance too. With its 1.5L petrol engine, and a manual or automatic transmission1 – and you can enjoy fuel economy up to 19.6 km/L. Electric power-assisted steering (EPAS) is standard. This advanced system constantly adjusts its level of assistance depending on whether you’re driving at parking speeds or out on the road. Hill Hold and Hill Launch Assist can help prevent a collision by stopping you from rolling backwards when pulling away on an uphill slope. The PowerShift 6-speed automatic transmission has a dual clutch that pre-selects the next gear for you. There is no loss of power when shifting gears, and seamless gear changes also save fuel and reduce CO emissions compared to a conventional automatic.